It's the end of the beginning for Lara Croft. This feature was originally published in PC Gamer UK 318, published earlier in May. For more great features like this and tons more, subscribe and get PC Gamer magazine delivered to your door every month. In 2013, we met Crystal Dynamics’ rebooted Lara Croft—a young archaeologist who crash lands on a deadly island off the coast of Japan. Far from the confident adventurer of Tomb Raider games of old, this Lara was scared and unsure of herself—albeit in possession of a quiet, burning determination to survive and rescue her friends. In the reboot’s follow-up, 2016’s Rise of the Tomb Raider, Lara is more proactive. She travels to Siberia in order to follow up on her father’s research, and in doing so learns of the secretive and sinister Trinity organisation that killed him. This year’s Shadow of the Tomb Raider completes her origin story. Lara is now taking the fight to Trinity, and discovering how far she’s willing to go to get revenge. My initial reaction to playing Shadow of the Tomb Raider, and talking to the new lead development team at Eidos Montreal, was surprise that this latest game is continuing—and concluding—this origin story. Rise finished with Lara ready to take on the mantle of 'Tomb Raider’. She’d come to terms with her family’s legacy, and even raided a bunch of tombs. What does that leave? The answer, it seems, is another question: can Lara go too far? "We see her arrive in this game fully capable," says lead writer Jill Murray, "and now instead of learning new skills and how to survive, she has to realise how much power she has and decide what she’s going to do with it. A hero can also be a threat, so which one is she going to choose to be in the end? She is going to make a lot of mistakes and then have to confront her complicity." I get a sense of this at the end of the demo. Lara is in Mexico, on the trail of Trinity, trying to beat them to a magical dagger. She arrives at the tomb first, and, despite finding hints that taking the artefact might not be the best idea, grabs it to prevent it from falling into Trinity’s hands. Chaos ensues, as the temple collapses and the streets flood. Lara’s choice serves as the catalyst for Shadow’s overarching threat, which ties in with the Mayan apocalypse. Trinity’s leader catches up to Lara, retrieves the dagger, and admonishes her for her actions—moving out to stop the prophecy that she’s set in motion. "Normally it’s a race to get to the artefact, get it and slap on the back, good job, let’s move onto the next level," says narrative designer Jason Dozois. "Now we’re twisting that … The idea is that you’re going to get there and feel, 'Well, maybe it’s not the right thing, but I’m Lara, so I’m going to take it…’ And then from there you have this huge twist of things spiralling out of control, these catastrophes are coming. And Trinity, they seem to be going off to save the world, while I cause this apocalypse to happen—I think that’s a nice twist on the expectation people will have when they play." A key theme of Shadow—one that was hammered home during my visit to Montreal—is fear. Shadow of the Tomb Raider is not a horror game, but fear permeates its design. The realisation of that theme informs the look of Shadow’s tombs and the tension of the underwater sections, but it’s also a facet of the story and Lara herself—her ability to instil fear in her enemies, and her own fear about who she might become. "At a certain point in the story—I’m not going to spoil it—but Lara will go beyond her own morality," says game director Daniel Bisson. I’m interested in the idea of Lara causing fear in her enemies. Combat is my favourite part of the rebooted Tomb Raider series. Whether it’s using distraction and stealth to silently pick off enemies, or running guns blazing into the fray, the precise, efficient weapons lend themselves to a responsive combat style that favours movement, positioning and the use of an array of tools. While Eidos Montreal is vague about the specifics, I learn that the two aspects of combat—stealth and assault—will be more closely intertwined. "I’m not sure if you noticed it, but one thing that didn’t work out in Rise: if you were playing stealth and you got spotted, you were spotted, you were being shot at," says lead level designer Arne Oehme. "In Shadow, you can disappear again ... giving the player the power to re-engage with stealth if he or she desires to do so." Guards will be more aware of their surroundings, too. They interact with one another more, meaning they’ll notice if a guard you’ve taken down doesn’t respond on the radio. As enemies become more afraid of Lara, they’ll make mistakes. "They’re reacting," says gameplay director Vincent Monnier, "they’re talking to each other. And so these dynamics—being able to understand their fear and how their level of fear is evolving while you are actually manipulating them, that’s a pretty cool thing." Another key part of Shadow is the jungle—it’s both an environment Lara will be fighting in, but also a manifestation of her state of mind. "There’s so many adjectives that people think of when they think of the jungle," says Dozois. "It’s alive but it’s also death. It’s dangerous but it’s also beautiful ... it’s all these things. Lara is being hyper-focused to the borderline of obsession in there … She’s becoming the environment, she’s becoming what the jungle can be in all its full array." I see just a sliver of this mindset in the demo. For the most part, combat feels similar to the previous games. It’s been a couple of years since I played Rise of the Tomb Raider, but I quickly fall into old habits—throwing bottles to attract a guard’s attention, or running in to bring down more heavily armoured enemies with the shotgun. But I also discover a new hiding spot. As I quietly pick off an arena full of Trinity soldiers, I run up to a wall covered in vines. Lara merges into them—disappearing entirely. It’s a neat, Predator-esque animation that indicates a more guerilla-inspired fighting style. While a new type of cover is hardly a transformative experience, Eidos Montreal hints at a more fully-fledged take on the theme. "The combat is way different," assures Bisson, who references Shadow’s CGI trailer, in which Lara uses mud as a form of camouflage. "In this game we’re pushing the stealth further, and we’ve all these tools and features to reinforce that aspect of becoming the jungle." 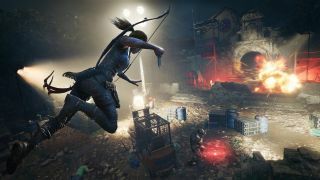 Structurally, Shadow of the Tomb Raider sticks closely to its predecessors, with players embarking on an adventure that will contain aspects of survival, crafting, exploration, platforming, puzzles and combat. "Usually the game gets broken down into something we call a blueprint," says Oehme, when I ask about how these disparate elements are put together. "You take the story and you place it out and ask, 'Okay, each story beat, each story moment—what is the emotional message? What does that need in terms of gameplay? Is this a combat moment? Is this a traversal moment?’ Traversal is also like swimming, for example." Yes, continuing with the theme of fear, Shadow of the Tomb Raider is bringing back underwater exploration. "We did a post-mortem of Rise and we were looking at what people were reacting to, what they loved," says Bisson. "The underwater was something that people were constantly coming back to. They wanted more of that, even though there’s a challenge to doing underwater." Fans of the original Tomb Raider games (or any ’90s platformer) will remember the terror of navigating an underwater maze, searching for a way up to the surface before you drown. In the demo I play, the underwater sections are little more than a cutscene—atmospheric vignettes where I hold down 'W’ to progress through scripted peril. "The underwater works very similar to the other gameplay types in the way that there are experiential sections," explains Oehme, "some of which are linear and revolve around the introduction of a certain experience." The experience being introduced to me here was that of nearly drowning; of just reaching an air pocket at the very last second. Oehme suggests that this tension will be a key part of the more open underwater exploration. "Where do I find my next air bubble? Will there be one? If you squeeze through a tight gap, you don’t know if you’re going to get back, you don’t know what’s going to be on the other side." As with the previous games, Shadow’s story will utilise a series of hub areas that Lara can return to. "We are going to have a few hubs," says Murray, "including the biggest hub that we’ve had so far. So people will get a more up close and personal look at the culture, not from the perspective of the artefacts necessarily, but meeting people and having to live alongside them." This 'biggest ever hub’ is something teased but not detailed by every developer I speak to. Monnier, for instance, claims that, "underwater is definitely part" of it, while Oehme hints that this area might change in response to your actions. "The hub has a different aspect to it because of the living world," he says, referring to the jungle setting. "There is much more we can work with, with how the player plays and what the player has achieved during the game." A big, secretive hub is nice and all, but fortunately Eidos Montreal are more open about one of the most important parts of a Tomb Raider game: the tombs. As in Rise, tombs feature both during the story and in exploration, and each acts almost like a puzzle. Fear again plays an important role. Where Rise featured grand tombs, Shadow is deadlier and more spiky. "Yeah, just thinking about them now, there’s certainly a lot of spikes!" confirms Oehme. "It’s an ancient and dangerous location," Oehme continues, "perilous and claustrophobic in parts, and this leads to what we call the terrifying vista, which is when you get the first view of the tomb itself. This is very, very important, like you’re seeing your adversary. That’s the character of the space, the character of the puzzle that you’re looking at, and it’s looking back at you. And then you dive into the puzzle itself which is made in a way that has much more deadly content than before. There are many more traps that can kill you inside the puzzles." I play through one such tomb in the demo, and, after making my way through some traps, get a view of its 'terrifying vista’. The room itself is huge and ominous. The camera pulls my attention to the centre, where a shaft of light illuminates the dais on top of an underground pyramid. That’s my goal—an ever-present beacon as I traverse around the edge of the space, enjoying the snappy, streamlined platforming. The main puzzle of this area—what Oehme calls the "puzzle avatar", as it expresses the personality of that tomb—is a series of carts and pulleys. This is classic Tomb Raider puzzling, complete with a section where I have to use Lara’s bow to tie a rope from a pulley system to one of the carts—using its weight to hold some suspended boxes in place. This is just an early example, though. Many later puzzles will be more deadly in their design. "Some of them are designed to kill you by the Mayans and the people who created those tombs," explains Monnier. I ask whether such deadly puzzles will lead to trial and error solutions, but Monnier quickly shoots that down. "We avoid trial and error, where you’d have to die to understand what’s happening," he says. "What we use, from the beginning of this trilogy, is tinkering. This tinkering is really about manipulating, usually the physics object and pulling things and making you go, 'Oh, okay, so if I put that there and do that it’s going to work, but if I do that I’m going to die.’ That’s why players usually don’t feel cheated by the game, because you always have a way to anticipate any kind of danger." I leave Montreal with a question: has Lara gone far enough? I’m intrigued by what I’ve heard—particularly the hints about a more stealth-based combat system created by a studio that’s renowned for stealth combat. But for all of Eidos Montreal’s hints about what lies deeper in the game, nothing that I’ve played suggests anything markedly different from its predecessors. Shadow of the Tomb Raider looks bigger and more detailed, and with more atmosphere to its setting, but I’m yet to be convinced that becoming "one with the jungle" is anything more than a tagline hanging off a similar experience. Luckily, I’m not too afraid: at the very least, Shadow of the Tomb Raider should, like the previous two games, be an entertaining adventure romp. If we’re lucky, it will be even more besides.